PMT 37 degree flared Tube Fittings is compact and simple in design for assembly and assures maximum reliability and performance. It is especially suited for low and medium wall tubing with good vibration resistance in a broad selection of types and sizes. It is used in virtually every application that uses fluid power for motion control & automation. PMT 37 degree flared Tube Fittings consist of three precision components such as Body, Sleeve and Nut. These components have been manufactured to very stringent tolerances under rigid quality control procedure approved to ISO 9001 : 2000. PMT 37 degree flared Tube Fittings meets SAEJ514 Standard. The Tube end is flared at a 37 degree angle and sandwiched between the fitting body nose (seat) and the sleeve with nut which provide a very effective leakproof joint, full flow connection in process tubing. PMT 37 degree flared Tube Fittings are available as a standard in SS316 material, which meets the following specifications. Other materials are available on request. PMT 37 degree flared Tube Fittings provide zero leak, full flow connection in hydraulic system operating at working pressure as specified below. Allowable working pressure ratings are based on min. design factor 4:1 for dynamic and 3: 1 for static application. Note:- Since many factors influence the pressure at which a system will or will not perform satisfactorily. Details as shown in the above table are only guideline & not rigid. Fractional Size Ranges from 1/8" through 1"
Stainless Steel 316 or 304 seamless tubing should be fully annealed, according to Standard ASTM-269 suitable for bending and flaring. Length of finished tubing shall be reasonable straight and have smooth ends and free from burrs, scales and any kind of defect and scratches. Fractional size ranges from: 3/16" through 5/8" Tube OD. Ensure that the end of the tube is cut square within ±1 degree and remove the burrs and sharp edges. Wipe the ID and the OD of the deburred Tube end properly. Dimensions are for reference only, and are subject to change without notice. Screw the nut on the body until finger tight. Further tighten the nut with a wrench ¼'' turn in order to make a leakproof metal to metal sealing connection. 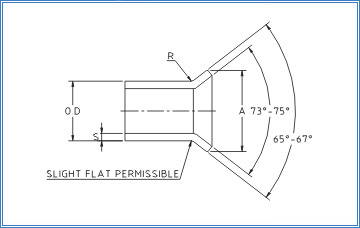 The Part Number describes fittings body only.